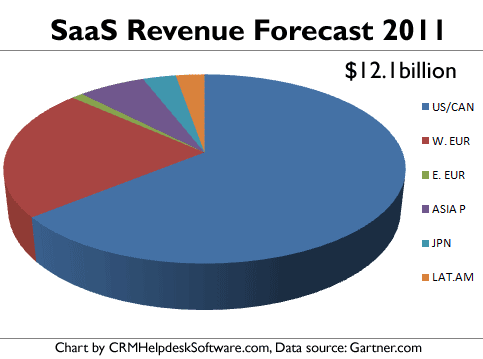 Worldwide software as a service (SaaS) revenue for 2011 is forecast to reach $12.1 b. This is a 20.7 % more than last year (2010: $10 b), according to the Gartner report "Forecast: Software as a Service, All Regions, 2010-2015. 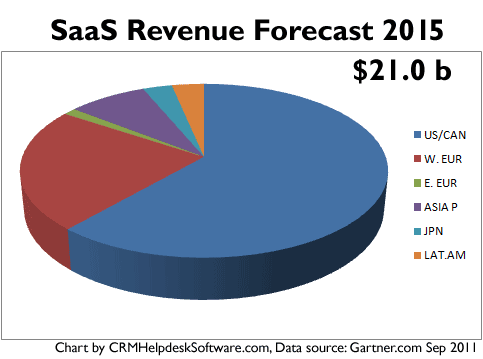 The North American region is forecast to account for 63.6 percent of worldwide SaaS revenue in 2011. By the end of 2015, North America’s share will represent 60.8 percent of worldwide SaaS revenue. "Increasing familiarity with the model, continued oversight on IT budgets, and the growth of platform as a service (PaaS) and developer communities and interest in cloud computing are now driving adoption forward," said Sharon Mertz, research director at Gartner. while ease and speed of deployment is the key reason for choosing SaaS in Asia/Pacific and North America." The top issues encountered when deploying SaaS also vary by region. Limited flexibility of customization is a top issue in EMEA, while limited integration to existing systems is the primary reason in North America and Asia/Pacific. North America, specifically the U.S., represents the largest opportunity for SaaS, and it is the most mature of the regional markets. SaaS revenue in North America is projected to total $7.7 billion in 2011, an 18.7 percent increase from 2010 revenue of $6.5 billion. North American SaaS revenue is forecast to reach $12.9 billion in 2015. "In North America, ease and speed of deployment are primary reasons for SaaS adoption, followed by lower TCO," Ms. Mertz said. "Limited capital expense is also considered more important in North America than in the other regions. Consistent with the other regions, CRM shows the highest use of SaaS among enterprise applications while use of Web conferencing, e-learning and travel booking is higher in North America than in the other regions." In Western Europe, SaaS revenue is on pace to reach $2.7 billion, up 23.3 percent from 2010 revenue of $2.2 billion. 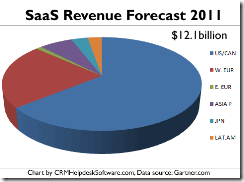 SaaS revenue is projected to reach $4.8 billion in 2015. In Eastern Europe, SaaS revenue is expected to reach $131.4 million in 2011, a 29.8 percent increase from 2010 revenue of $101.2 million. Eastern Europe SaaS revenue is forecast to total $270.1 million in 2015. "SaaS penetration and adoption is occurring mostly in Northern Europe, which is composed of the U.K., Ireland, the Netherlands and Nordic countries," Ms. Mertz said. "This is due to a culturally open outlook toward technology adoption, well-established and generally good Internet infrastructure within these countries, and English being the primary business language. This also makes it much easier for North American vendors to branch out into the region and for local vendors in one country to adapt and sell their applications in other Northern European countries with less localization effort." SaaS revenue in Asia/Pacific is forecast to total $768.3 million in 2011, a 27.7 percent increase from 2010 revenue of $601.8 million. By the end of 2015, SaaS revenue in Asia/Pacific will reach $1.7 billion. 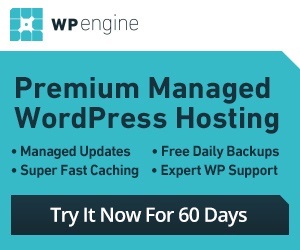 "SaaS adoption is more prominent in the more mature markets in Asia/Pacific, such as Australia, New Zealand, Hong Kong, Singapore and South Korea, because of their established infrastructure, such as more-stable networks, as well as the availability of vendor sales, marketing and support service structures. In many cases, the use of English as a common language in these countries, except in South Korea, makes them an attractive destination for foreign providers investing in the region," Ms. Mertz said. In Japan, SaaS revenue is projected to reach $379 million in 2011, up 20.2 percent from 2010 revenue of $315.3 million. By the end of 2015, SaaS revenue is expected to reach $629.1 million. "SaaS demand in Japan will grow for sales force automation solutions to improve reaction to customers, while demand for marketing analysis solutions will also be higher," Ms. Mertz said. "In addition, it is easy to adopt SaaS solutions for B2B call center services because the workflow of this business is standardized and transaction volume is constant in Japan." SaaS revenue in Latin America is on pace to total $328.4 million in 2011, a 23.5 percent increase from 2010 revenue of $266 million. While in general the SaaS market in Latin America can be considered embryonic, many Latin American CIOs see the strategic importance of SaaS. 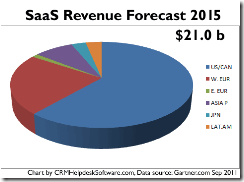 Gartner expects overall software revenue for SaaS in Latin America to rise to $694.2 million in 2015.